I’m not particular keen on fish pies. People often have fish at work and it stinks the place out; in a confined space like a boat it is even worse. That said, I had some fish kicking about in the freezer so decided to get it out and have a try of another Gurpareet Bains’ recipe from The Superfood Diet. I changed the recipe a little as I don’t think boiling Butternut Squash or Sweet Potato in a pan is the best way of preparing it. I prefer to roast it and then mash it. Much tastier. The mash is then mixed with some toasted cumin and mustard seed and a little turmeric – and finally some peas. In hindsight I would have put the peas in the base with the fish. The peas looked a little worse for wear after being baked in the oven for 40 minutes. 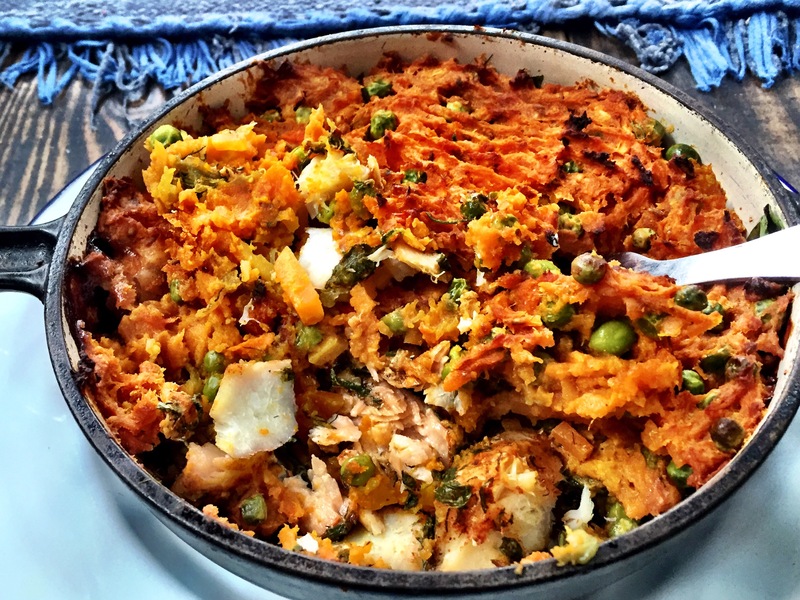 The base was a made up of the mixed fish pieces (I used Salmon, Smoked Haddock and Cod) which was seasoned with Smoked Paprika, Dill and Black Pepper. Finally you assemble the pie by mixing the fish with spinach, grated carrot and grated celery, and then topping with the mash. This was very low in calories and very tasty. It was however a bit dry as there was no sauce surrounding the fish. Very tasty, very filling but if I make it again I’ll need to find a sauce solution. I was stuffed after finishing it but I think it was just hard going eating it. Saturday 13th was the eighth leg of our Year and Day Monopoly Board Pub Crawl challenge. For those of you not familiar with the concept, before you get married there is a tradition of a Stag and a Hen event; where the men all go and do something for their last day of freedom and the women all do the same. Over the years these two events have tended to get merged into one and everyone just goes out together prior to the wedding and has a good old party – usually very much geared towards the consumption of large amounts of alcohol. If you live in London, are very much inclined to more than just few drinks in the evening, and love a challenge, then Monopoly Board Pub Crawl is the thing to try. Many try. Many fail. We decided to put our own spin on this event by having a drink (often more) in every pub in every street on the Monopoly Board – instead of the traditional one drink in one pub on each street. We also decided to do one colour of the board per weekend and spread these out over the year – instead of the traditional all 26 streets in one day rule. Anyway, yesterday we were round to the Yellow part of the board and we had a great time. We also had a fly over from the Red Arrows – although they were perhaps celebrating Trooping the Colour rather than our wedding jolly! With Browns, Light Blues, Light Purples, Oranges, Reds, Two Stations and now the Yellows complete all that is left is the Greens, the Dark Purples and Two stations and we’ve completed the whole thing! When we are done we plan to choose our favourite pub from each street and attempt the event in the traditional style – 26 pubs in 12 hours. Anyway, nothing to do with food ! We had this salad on Friday and it is packed with fibre and protein. There’s nothing to it really. It’s just very tasty and far better and cheaper than anything you’ll get from the pick and mix salad bar in a supermarket. 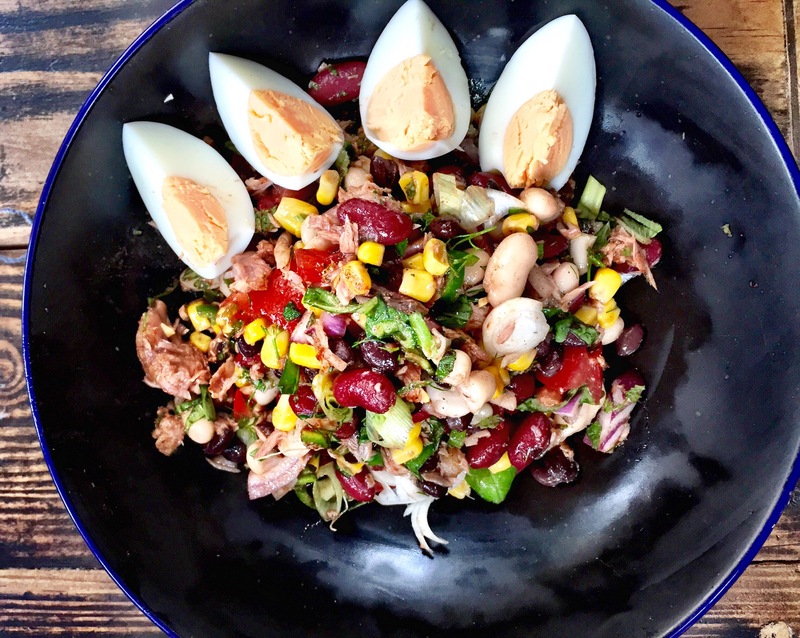 Simple mix tinned, flageolet, kidney and black eyed beans in a bowl with tinned tuna, tinned sweetcorn, a red onion, a tomato, lemon juice, olive oil, mint, basil, garlic, a green chilli, smoked paprika, and sugar in a bowl and leave for a while to let the flavours develop. Serve with some sliced spring onions scattered on top and a quartered hard boiled egg on the side. Personally I think the egg is unnecessary in this dish. You could easily leave it out. It was very filling as it was. This was really simple and really yummy. And ready in no time at all. All you need is a knife and a tin opener. I didn’t even need that as all my tins were ring pulls! Last night was dancing night. Rock n Roll at Hedsor Social Club with a live band – Greggie G and his Crazy Gang. It was great to catch up with all our friends that we usually see on a Tuesday when we have a dance lesson with Jumping Jim and V.
If you fancy giving it a go, come along. It’s great. Before we went out I just had time to knock up two very easy and very tasty salads – this was one. Most Caesar’s are pretty high in calories and fat but this one from The Superfood Diet was very healthy indeed. While you’re waiting for the chicken you make a dressing of Greek yoghurt, a small amount of full fat mayonnaise, honey, curry powder, coriander, mint and dill. All those fresh herbs and a but of curry powder really wake up low fat dishes – which can otherwise really taste dull. 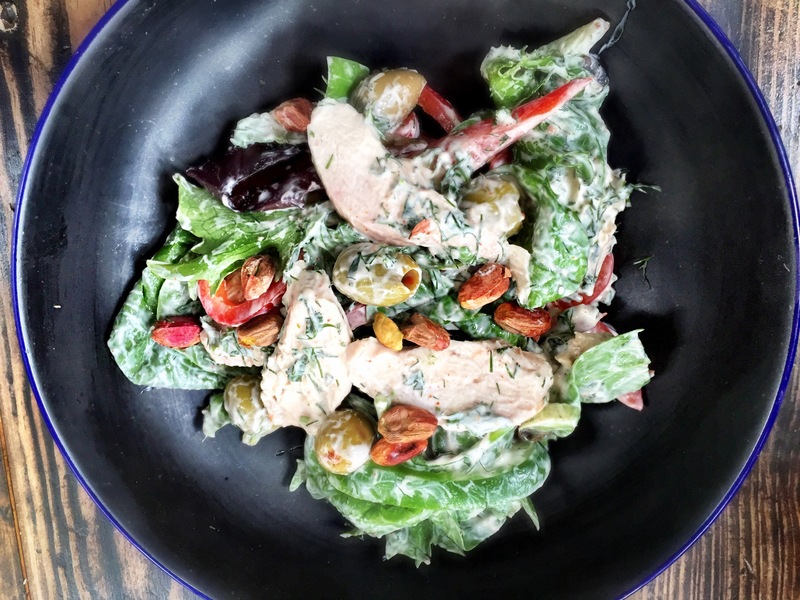 When the chicken is done simply combine some mixed leaves, the chicken, some pitted green olives and half a bell pepper with the dressing and mix well. Finally serve with pistachios. This comes out at about 150 calories a serving compared to a regular Caesar which tends to push 900 calories. Granted there was no bacon but I didn’t think the dish needed it. And pistachios are far cooler than croutons any day! This salad was amazing. It was too big in fact. Really tasty and bags of flavour. I loved it. It’s always nice to be complimented on your weight loss too. Our friends at Hedsor all said we’d lost tonnes of weight. So good like this really works! I had planned on making three dishes tonight but after the amazing Tabbouleh I decided to forget about one of them and just put this really simple carrot salad together. 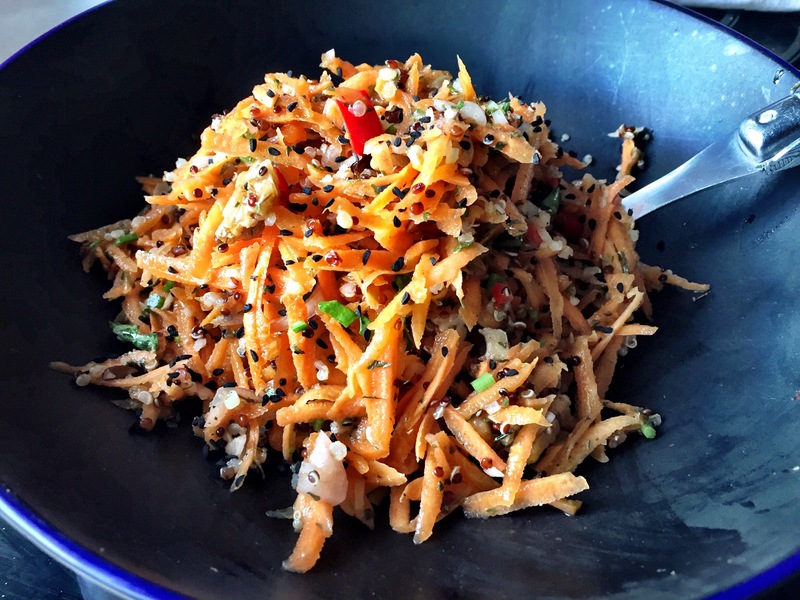 This is probably the best carrot salad that I’ve ever eaten. What makes it super amazing is the walnuts and the red chilli. Phenomenal. This salad is also from The Superfood Diet by Gurpareet Bains. New book – two out of two great recipes. I’d already held back a small amount of cooked Quinoa from the Tabbouleh; and again that is the only cooked element. Putting it together you add walnuts, a red chilli, a shallot, fresh coriander and garlic to mirin, white wine vinegar, and walnut oil. To this mix add your grated carrot and your cooked Quinoa. I grated half the carrot recommended in the recipe – not out of laziness – I just thought the picture in the book looked too carroty. I wanted to see the Quinoa and the chillies and for it to look more interesting. I think this was a great move. You serve the dish with some poppy seeds sprinkled over the top. I didn’t have any so I used nigella seeds instead. Like the Tabbouleh this dish definitely benefits from an hour in the fridge for the flavours to develop. This salad will be seen again at this weekend’s BBQ – weather permitting! Wednesday night saw us being really naughty and eating a burger in The Railway – a JD Wetherspoons in Putney. Freya was meeting someone so I waited in the pub patiently with a pretty good pint of Devils Backbone American IPA. Tough as it was I managed. Today was time to rebalance the scales and have a much lower calorie dinner – just to put us back on track with the diet. This dish comes from a new cookbook that I only received today – The Superfood Diet by Gurpareet Bains. He has previously published Indian Superfood and it is a great book too so I knew I’d made a good choice. It’s the first of two dishes we ate today. Both are very low in calories and both very very easy and tasty and good for you. The only thing you cook in this dish is the Quinoa – unless you fancy cooking your own Puy Lentils. I never do; the precooked stuff from Merchant Gourmet is spot on for this kind of thing – especially given you serve the dish cold. If you cook the lentils you’ll have to cool them! 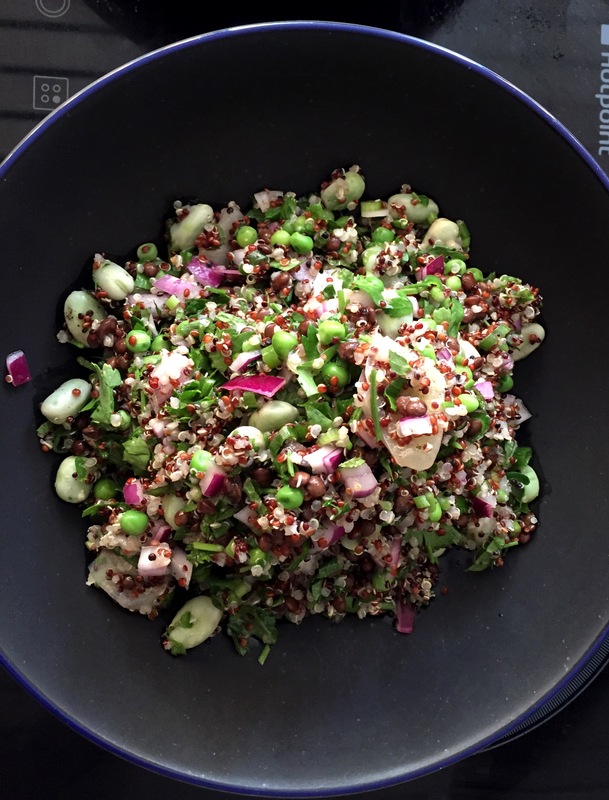 To the cooked and cooled Quinoa you add Puy Lentils, fresh petite pois, fresh broad beans, a red onion, a spring onion, parsley and mint and mix it all together. The recipe says you can use frozen peas and broad beans and this will soon be a necessity as the fresh variety will be hard to come by soon. To the mix you add a really simple dressing of lemon juice, garlic, olive oil and black pepper. I added lots of lemon juice and all the bits still left over – segment skins and all. It made the dressing super lemony. Finally, stir the dressing into the Tabbouleh and chill for an hour to let the lemons infuse into the salad. This salad is amazing. So tasty, crunchy, lemony and herby. Really great salad. We are having a BBQ at the weekend and if we do I’ll certainly make this again as a side. For my Tabbouleh I used mixed Quinoa which had red, black and white Quinoa combined. Regular quinoa can get a little too fluffy and looks a bit plain on the plate. The mixed quinoa cooks at different rates and you get some interesting textures; it looks prettier too. Loved this. Will definitely make it again.